We love going to the theatre and have been fortunate enough to see a number of shows taking Monkey from the tender age of two. 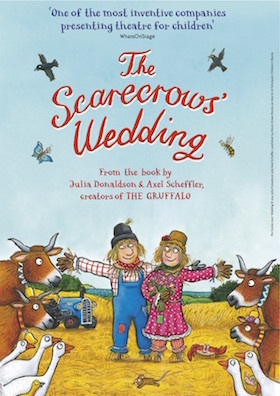 When I saw The Scarecrows Wedding advertised I booked us tickets straight away, just as well as it has proved very popular we couldn’t get into the 2.30pm show it was a complete sell out. We have visited a number of Julia Donaldson’s books on stage and like others we were not disappointed. Unlike some of the other shows we have seen there is very little audience participation but the story is easy to follow and not as abstract as some shows! For those of you who don’t know it is broadly about two scarecrows Betty O’Barley and Harry O’Hay who want to get married. In order to do so they write a list of things they need for the day and the rest of the story covers their adventures around getting them – white feathers, cow bells, two rings, a necklace of shells and of courses lots and lots of pink flowers. There is an awful lot of props, much more than we have seen elsewhere and when you first walk into the theatre you could be forgiven for thinking you have walked into a table top sale. However they do use the majority of it throughout the show, which is affectionately told through the farmers eyes. Everything seems to be going to plan until Harry heads off to find the last item on the list – the flowers. It take him longer than planned and in the meantime the farmer introduces a new scarecrow Reginald Rake, who has eyes for Betty. Thankfully she resists his charms (Que. hilarious dance routine complete with flamboyant Spanish outfit) seeing him off, but not before he leaves her in strive with the arm chair on fire. Harry returns just in time to put out the fire, save Betty and make her his bride. A very happy ending. There is lots of guitar, accordion and banjo playing as well as singing. It makes it a lively show which lasts for abut 50 minutes, Monkey wanted to get up and dance at some points but other than that he was glued to his seat the whole time. The cast of three never stand still and come across brilliantly. I would definitely recommend seeing this if it is coming to a town near you. The show is put on by Scamp Theatre, you can see a list of venues here, and is running until the 24th November 2015. Recommended for ages 3 and up. If you would like to see some photos of the actual cast and props there are some on the review here. What have your kiddies enjoyed at the theatre recently? Thank you for the heads up, we have seen the stage performance of the Gruffalo and despite owning a large range of Julia Donaldson’s books we’ve not come across this one. I’m looking forward to reading it and will be sure to look into the theatre production. 🙂 Glad Monkey enjoyed himself. Aw this sounds like a fun show to watch! I’ve never really taken mine to the theatre much, but we saw Horrible Histories this year and they loved it so much I am definitely taking them back to see something soon!